The memory is divided in 128 blocks of 64 kb each. 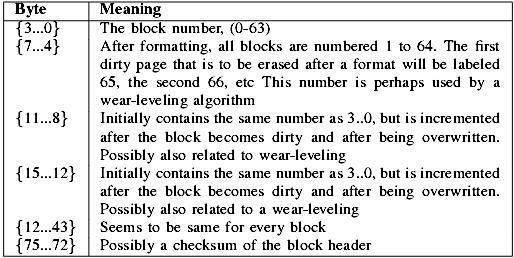 A block starts with a 76 bytes block header, which holds information about the block. The rest of the block contains data sectors and sector headers. Each data sector has a 27 bytes wide header located just after the block header header. Data sectors are written to a block in a “bottom-up” fashion, and can have a maximum size of 512 bytes. Sequences of one or more data sectors constitute a stream. A single stream can represent any kind of data, for example, a file or a directory table. 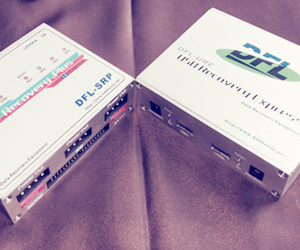 The data sectors that a stream consists of need not be stored in a sequential manner, and can span multiple blocks. The size and position of a data sector is determined by its sector header. 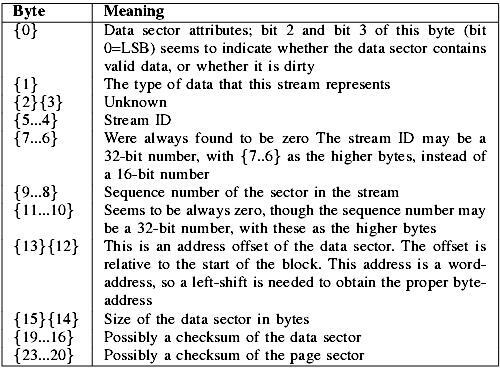 The sector header also determines which stream the data block belongs to, and the sequence number of the data-block. does not point to any data sector. Then a list of ‘useful’ data sector headers follows. The list of sector headers is of constant size. Table I and table II contain partial specifications (determined from experiments) of the fields of block and sector headers. When a file is deleted the sectors of a stream become dirty, this is achieved by setting the valid bits in the sector header to 0. The sector still exists in the flash device, but is marked as dirty.